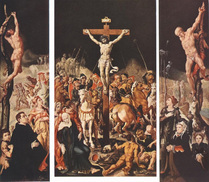 The following depictions of the Crucifixion are arranged chronologically. 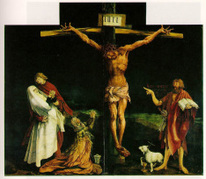 Jesus' tunic is being shown in the lower right. 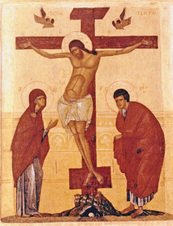 Notice the manner in which the thieves are on their crosses. 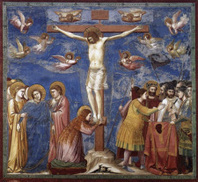 Once again, the an artist did not know that John the Baptist was beheaded at the time of the Crucifixion. For more information on the confusion in depictions of John the Baptist, use this link. 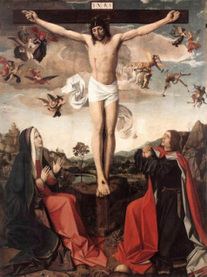 The two thieves are crucified on trees. The following table will organize the information that has been presented. 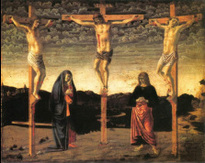 Single crucifixions were the standard until the 15th century. 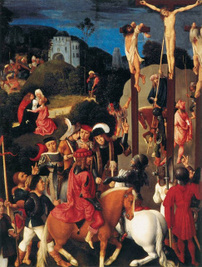 Thieves are shown in three paintins in the 15th century (c1441,1454-55 and c1487). The vast majority of the paintings show multiple onlookers. 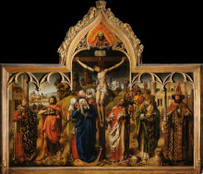 Only 3 of the 14 paintings have two witnesses. Soldiers may be depicted by Giotto, 1305, but it is not certain. The first definitive depictions of soldiers is c1487. Except for one painting, all show Jesus looking to the left. In the 1426 painting, Jesus is looking ahead. It is interesting that horses were not shown until 1487. One horse is brown and the other horse is white. In 1543, three colors of horses are shown: brown (3), white (2) and black (1). It would appear that from the 14th century to the 16th century, more information and more elements were available for the artist to depict. A possible reason for variable number of elements is that the crucifixion story was evolving and there were no fixed canon of depictions. 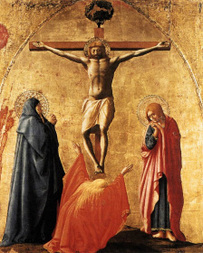 Indeed, in the Western Church, there is no standard iconography for the crucifixion to this day. 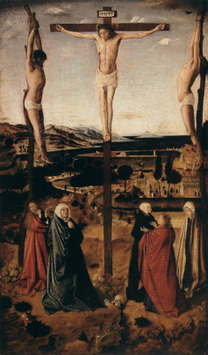 The crucifixion of Saint Andrew. This is NOT Jesus on a tree. The thieves' arms are not outstretched on the cross bar. Apprentice Tyler examines the use of time in the Gospel narratives. 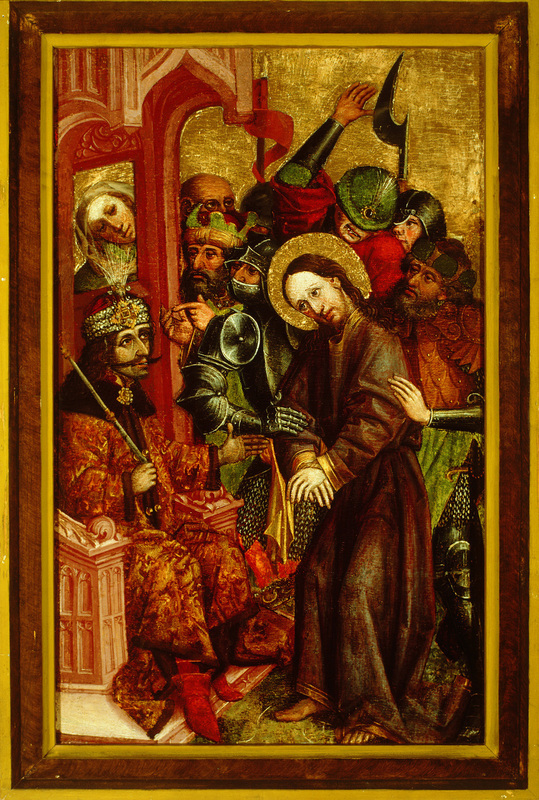 Vlad the Impaler judging Christ.